I brought home this amazing chiffon layered sweater from Zara today. My heart is still racing from the experience. No, not from the joy of finding a piece that feels like it was made just for me, but rather from today's shopping experience as a whole. Today I dashed into Zara for a breather before my afternoon editing session. (Yes, I sometimes use shopping as a palate cleanser. What? You don't?) In no time at all I zeroed in on what is pretty much my dream sweater, but when I went to the cash register there were a zillion people in front of me. With only 10 minutes to spare before my meeting, I'd never make it at that rate, so, being the Zara-savvy gal that I am, I knew that if I hopped in the elevator and headed up to the 3rd floor men's section, I'd be out in a jiffy! Aren't I clever? I get in the elevator with one of the saleswomen. Doors close. Elevator goes up. A little. And stops. In between floors. Stuck. Broken. Busted. Stopped. Not moving. And small, very very small. I'm not claustrophobic really, but that doesn't mean that I relish the idea of being trapped in tiny metal capsules. So for half an hour, literally, we sat there. Various employees came and visited us, chatted with us. Eventually the emergency technician came and got us out, though needless to say, I did not make it to my meeting. Afterwards, finally paying for my sweater, I asked if there was some kind of a trapped-in-your-elevator discount, to which they laughed and said no, but if I wanted I could have a bonbon. (If this had been the US wouldn't they be falling all over themselves giving me gift cards and discounts and whatever else so I wouldn't sue them? Or something?) I suppose I could have just left, but I really wanted that sweater. I passed on the bonbon. But I will admit to buying lots of therapeutic cookies and chocolate on my way home. It sure is a nice sweater though, isn't it? I SO would have taken the bonbon, actually make it a few!That is a nightmare shopping trip! And this is why I hate elevators. really don't like them. Great sweater though. TOTALLY worth it. I dare-say getting cut in half would also have been worth it. The sweater is divine. what? you can't sue stores in spain for getting stuck in their elevators? uncivilized! 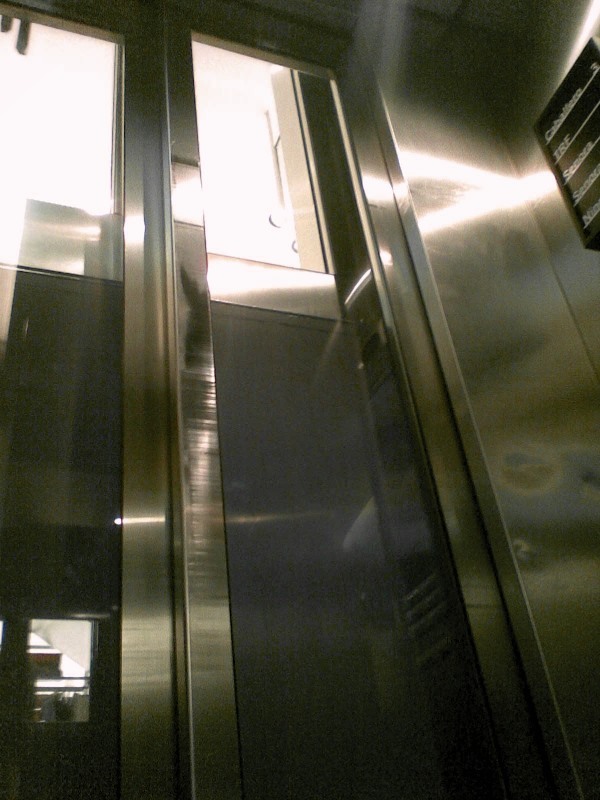 being stuck in an elevator, though distressing, is nothing like the idea of being cut in half. that freaked me out. the sweater, though, is gorgeous. looks like a more wearable version of helmut lang stuff. love it. I'm glad you made it out ok. Gotta love Spaniards, es mi Madre Patria on my dad's side afterall. Cute sweater ! Getting stuck in the elevator sounds terrible! I hate enclosed small spaces though and would have been a nervous wreck. That sweater is pretty amazing though- I love the double layer look. Also thank you so much for your advice on the camera. I don't think I really care about video since I rarely take anything like that even on my iphone. Do you mind me asking what your runners up were?